TeraFlex Dana Heavy-Duty Differential Cover Kits provide extreme protection from rocks, obstacles, and other debris on the trail. I installed this product on my rear differential housing and they sure do look good. heavy duty application, easy to install and an upgrade cosmetically over the standard covers. These Dana44 covers hang below the stock JK Differential center sections about 1/4", and need to be ground down before playing in the rocks. 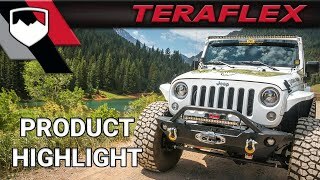 I contacted Teraflex on this, and according to the response, they are designed to fit flush on their HD44 axle housings, not stock Jeep housings. That information should be in the description. Easiest way to do this job, is some bluing on the lower lip, then use a scribe to make a line flush with the center section. At that point you can grind the covers on a bench, instead of under the vehicle. I like the covers but would have bought something else if I'd have known this before I purchased. It's a lot of grinding to make it right. These diff covers are awesome. Perfect fit, beefy and custom painted. Plus you can't beat the price!